MINNETONKA, Minn., U.S.A., June 12, 2018 – Syngenta today announced that, it has agreements in place with more than 30 ethanol plants with a combined production capacity of approximately 3 billion gallons. 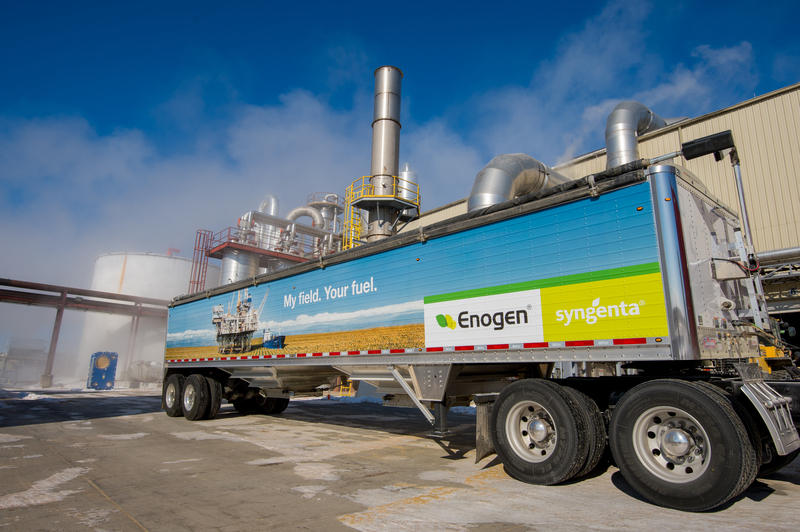 As new plants come on board, Syngenta expects ethanol produced with Enogen® corn enzyme technology to be approximately 2.5 billion gallons during 2018 alone. Enogen corn is an in-seed innovation available exclusively from Syngenta and features the first biotech corn output trait designed specifically to enhance ethanol production. Enogen corn is rapidly gaining widespread acceptance because of the value it delivers to ethanol producers and the opportunity it provides corn growers to be enzyme suppliers for their local ethanol plants. The robust alpha amylase enzyme in Enogen grain significantly reduces the viscosity of corn mash and eliminates the need to add a liquid form of the enzyme. This breakthrough reduction can lead to unprecedented levels of solids loading, which directly contributes to increased throughput and yield potential, as well as critical cost savings from reduced natural gas, electricity and water usage.1 Enogen corn also enables ethanol plants to gain corn market knowledge from mid-year corn estimates. To inquire about incorporating Enogen into a dry grind ethanol plant, contact Jeff Oestmann at jeff.oestmann@syngenta.com. For more information about Enogen corn hybrids, contact a Golden Harvest® Seed Advisor or NK® retailer, or visit www.Enogen.com. Join the conversation online – connect with us at social.SyngentaUS.com. 1Calculations based on Enogen trial and commercial results at Midwest ethanol plants. Syngenta is a leading agriculture company helping to improve global food security by enabling millions of farmers to make better use of available resources. Through world class science and innovative crop solutions, our 28,000 people in over 90 countries are working to transform how crops are grown. We are committed to rescuing land from degradation, enhancing biodiversity and revitalizing rural communities. To learn more visit www.syngenta.com and www.goodgrowthplan.com. Follow us on Twitter® at www.twitter.com/Syngenta and www.twitter.com/SyngentaUS. This document contains forward-looking statements, which can be identified by terminology such as ‘expect’, ‘would’, ‘will’, ‘potential’, ‘plans’, ‘prospects’, ‘estimated’, ‘aiming’, ‘on track’ and similar expressions. Such statements may be subject to risks and uncertainties that could cause the actual results to differ materially from these statements. For Syngenta, such risks and uncertainties include risks relating to legal proceedings, regulatory approvals, new product development, increasing competition, customer credit risk, general economic and market conditions, compliance and remediation, intellectual property rights, implementation of organizational changes, impairment of intangible assets, consumer perceptions of genetically modified crops and organisms or crop protection chemicals, climatic variations, fluctuations in exchange rates and/or commodity prices, single source supply arrangements, political uncertainty, natural disasters, and breaches of data security or other disruptions of information technology. Syngenta assumes no obligation to update forward-looking statements to reflect actual results, changed assumptions or other factors. ©2018 Syngenta, 11055 Wayzata Boulevard, Minnetonka, MN 55305. The trademarks or service marks displayed or otherwise used herein are the property of a Syngenta Group Company. All other trademarks are the property of their respective owners. Syngenta announced today that its newest herbicide, Tavium® Plus VaporGrip® Technology herbicide, has been registered by the U.S. Environmental Protection Agency (EPA). Syngenta and the Analytics Society of INFORMS are proud to recognize a team from Germany as the winner of the 2019 Syngenta Crop Challenge in Analytics. Miravis® Ace fungicide for improved control of Fusarium head blight (head scab) in wheat is now available from Syngenta for the 2019 season.